Holiday Photo Session Special + Free Gift! The 2009 Holiday Season is upon us and Cynthia Spivack Photography is now scheduling Holiday Portrait Sessions for 2009! Also, be sure to sure to check out my website and the 2009 Holiday Deadlines! Experience the joy and ease of custom gifts and cards with Cynthia Spivack Photography! Oh..How we love our Dads! Can you believe it's already the middle of April?! This year seems to be flying by- it's going to be Father's Day before we know it! Now... I know Mother's Day is before Father's Day, and it is just as important... but apparently the entire month of March happened without me noticing! We all love our Dads dearly, so let's take some time to show Dad just how special he is! Give him a gift that will last a lifetime- pictures which he will cherish forever! Thanks to everyone who contacted me about booking a session through my New Years promo!! I am so thrilled from the response I got from all of you, and am excited to work with everyone. If you missed my New Years promo, please come back and visit- I'll be doing fun little contests and offering lots of giveaways throughout the year! Also, stay tuned to my website... it will be undergoing some changes in the near future (very exciting!). Wow! What an exciting response I have had to my 2008 New Years Special! 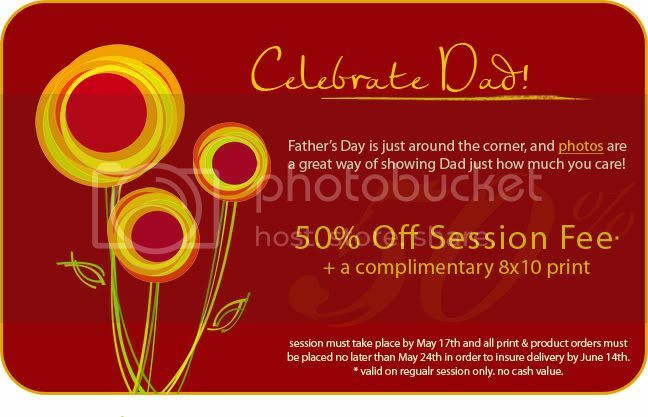 In case, you're just visiting my blog, there is ONE spot still available... so act fast to be the lucky recipient of a discounted session (50% off) and a free 8x10 print! It's a brand New Year. That means new beginnings, new adventures and, of course, new photo specials! To start the year off with a bang, I thought I'd make this offer a little more fun ! The first 8 people (yes... 8 for 2008) to email me and book a session will receive 50% off their session fee plus a free 8x10 print!